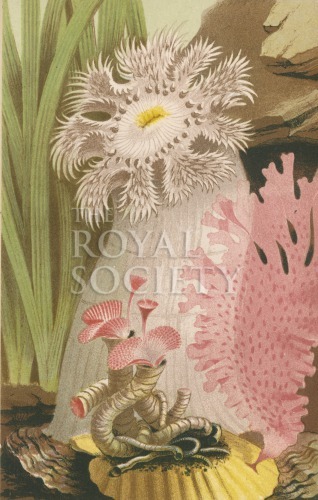 Underwater scene showing the plumose anemone (Metridium dianthus, here described by the author as Actinia dianthus) with tubeworms (Serpula vermicularis) and other marine life. The author commented in the accompanying text that the anemone was common in Weymouth Bay in Dorset: ‘The principal object in the accompanying Plate, is an expanded specimen of the Plumose Anemone, (Actinia dianthus) of the white variety, attached to an oyster-shell. In the front is a group of Serpula contortuplicata, with their cork-like opercula protruded, and their scarlet fans expanded. They are seated on a Scallop (Penten opercularis); from which also springs a frond of the delicately exquisite Nitophyllum punctulum. Behind the anemone are some tufts of the Sea-grass (Zostera marina). Philip Henry Gosse (1810-1888) was a populariser of marine biology and an aquarium inventor elected a Fellow of the Royal Society in 1856.